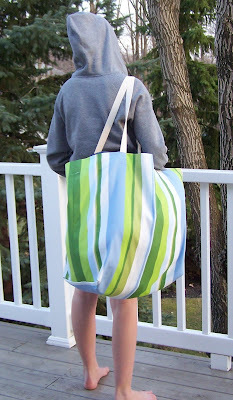 An over-sized beach tote in the fabulous Urban Green! 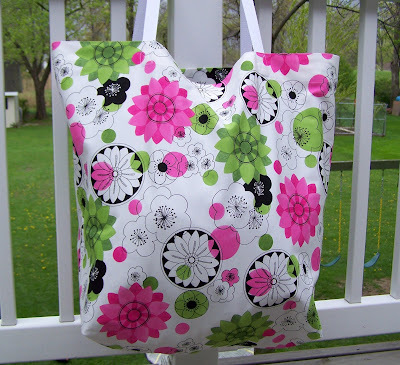 You may recall Annie sewed a purse out of this fabric design. 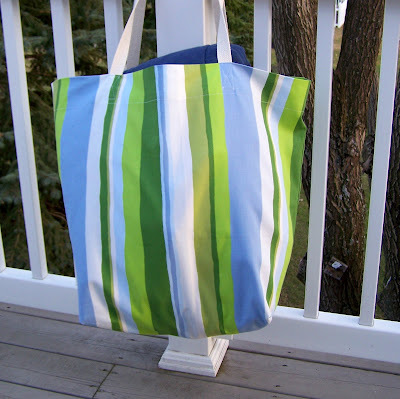 The fabric used for this oversized tote is in a home dec weight from Contemporary Cloth. 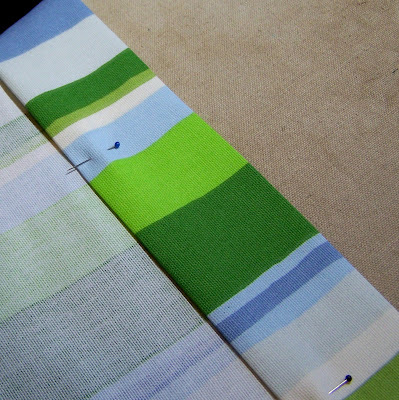 Check out all the Urban Green fabrics here! 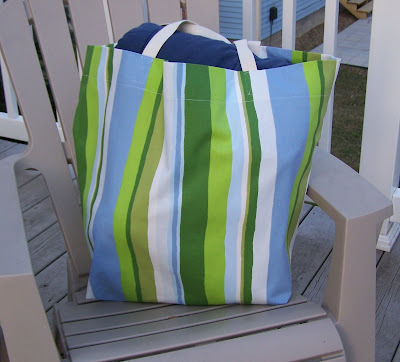 I have a number of oversized beach totes for sale in my Etsy shop, but you can make your own using the tutorial I first published over at Ready, Set, Craft! The tote would be a great gift for a practical Mother! I consider myself a bag lady. If we can get it in a bag, we can sling it on our shoulder and off we go. With four kids in tow, our many trips to the beach were an adventure. 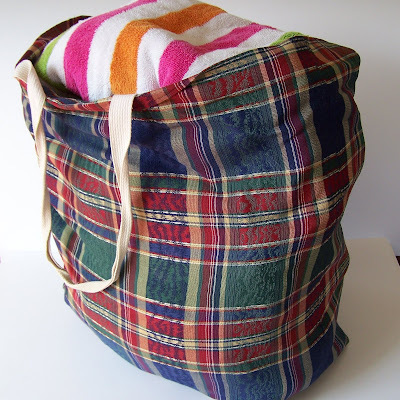 My husband suggested I make some over-sized bags to stash blankets and beach toys. 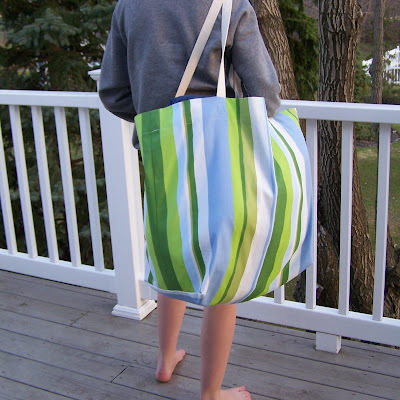 This bag, measuring 25″ wide x 28″ long, is holding 8 towels! It’s showing some wear, but it is at least 10 years old. 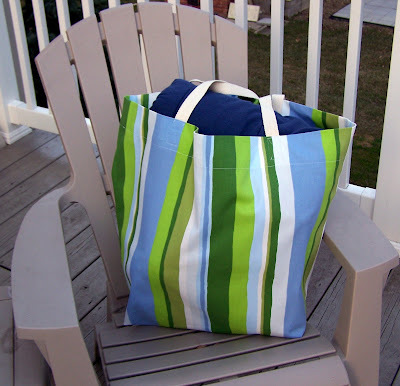 So, if you have more than 2.4 kids or even if you want a roomy tote for your beach quilt, this is a simple and satisfying project. 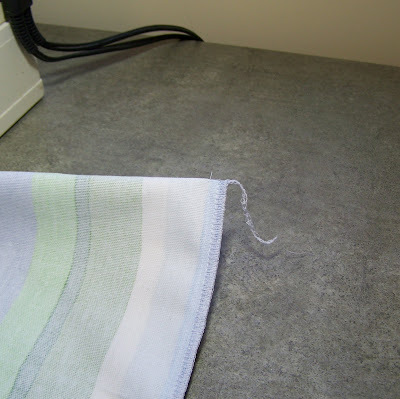 a cutting mat is shown here, but is not necessary for the project. 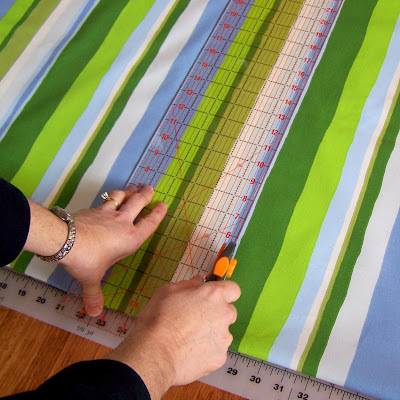 Simply use rulers or measuring tape. 1. 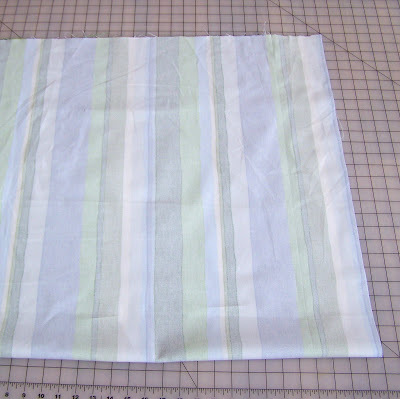 In this example, I am using a 44″ wide fabric. Because this bag is extra deep, I folded the fabric so that the selvedges lined up. 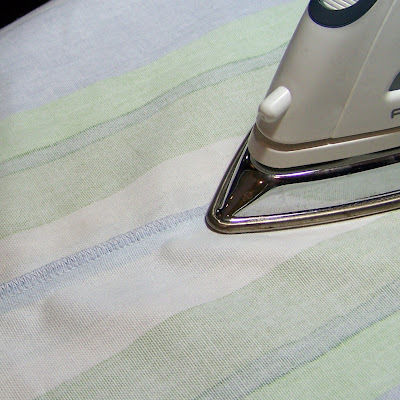 (Click here to see if you need help with preparing this fabric.) 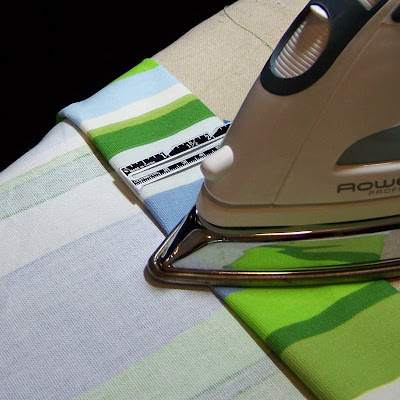 With a 54″ wide fabric, a standard fold is fine. 2. 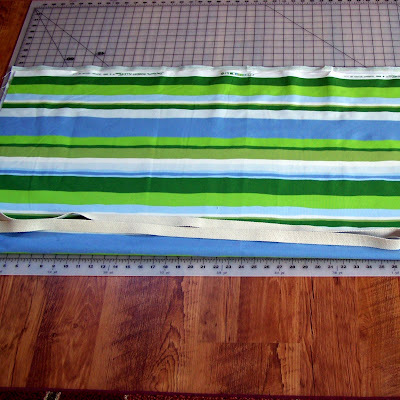 Cut the fabric at 27″ wide. 3. 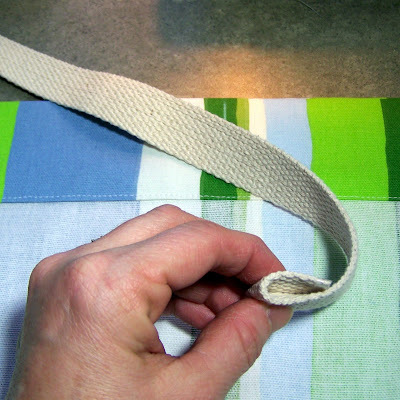 Fold fabric right sides together. 4. 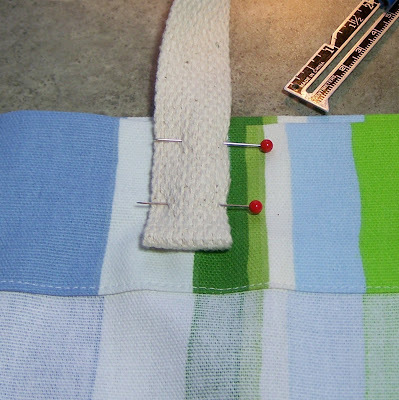 Stitch along sides of bag using a 1/2″ seam allowance. 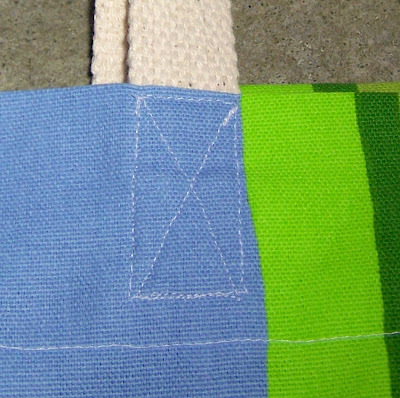 On the selvedge side, the seam allowance is larger to make sure the white selvedge does not show on the right side. No further finishing is necessary on the selvedge seam. 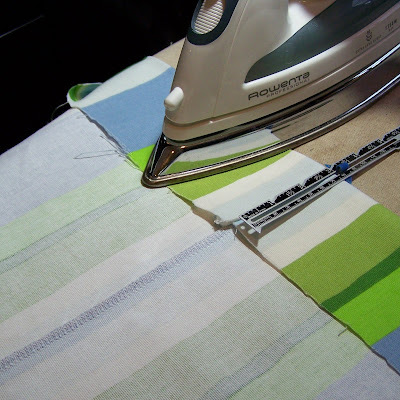 On the other seams, you can serge, stitch and then zig-zag or pink the edges, whichever finishing methods you prefer. 5. 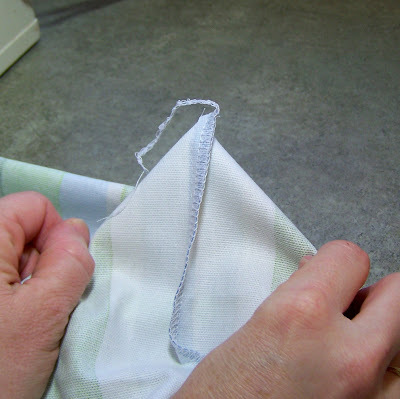 Take a stitched corner and pull apart the sides so that a triangle is formed and the side seam is in the center. 6. Even out the triangle and use a ruler to find the point where it is 9″ across. Draw a line at this point. 7. Stitch along the line. 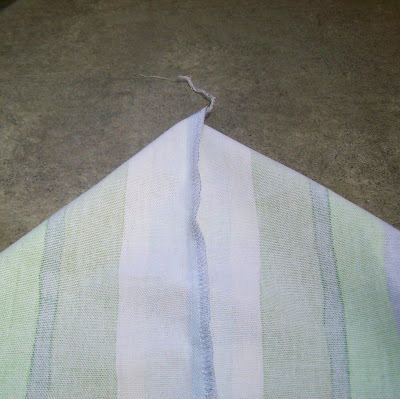 Cut off the triangle and finish the seam. This creates a boxed bottom for the bag. 8. Repeat step 6 and 7 for the other corner. Press all seams. 9. 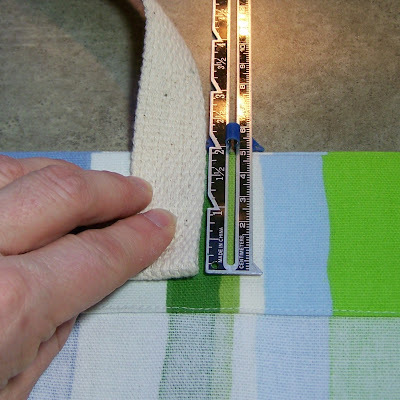 Fold 3″ of the top edge of the bag to the inside and press. 10. 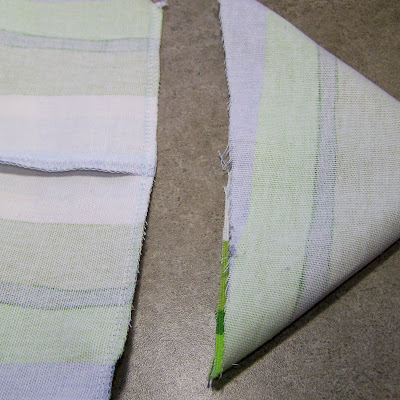 Fold the raw edge under 1/2″, press and pin. 11. 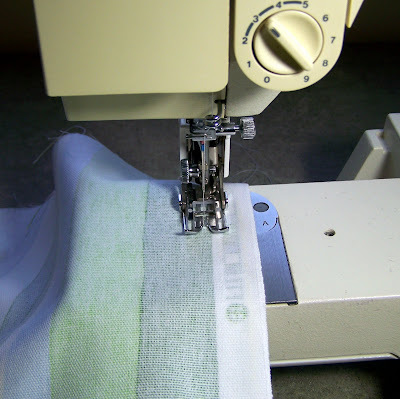 Stitch the top hem close to the folded edge and go completely around the circle of the bag. 12. Lay the bag open with seams to side. 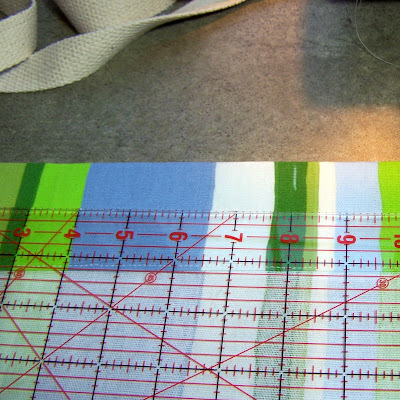 Mark a line 8″ from the seam edge on both sides. 13. Fold the strap under 1″ and place to the left side of the marked line (or to the right of the marked line on the right side). The fold of the strap should be two inches below the top. 14. This part is the most difficult in the entire process. Below you see the finished stitching from the outside of the bag. I stitch it from the inside. 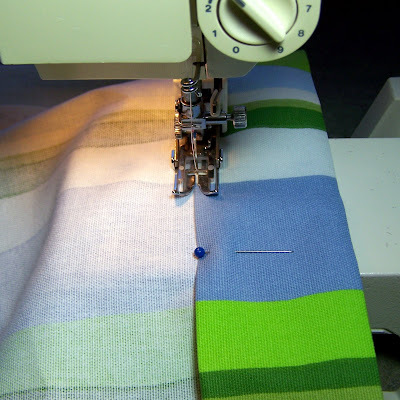 Starting with a backstitch to lock the stitches, I sew around the rectangle. 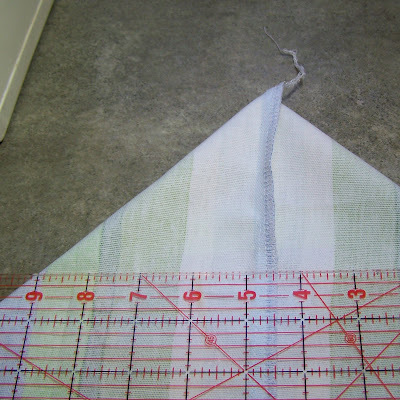 Then I stitch one diagonal line, stitch across the bottom and stitch the second diagonal line. You can stitch it in any manner you wish. The main idea here is to reinforce the handles. 15. 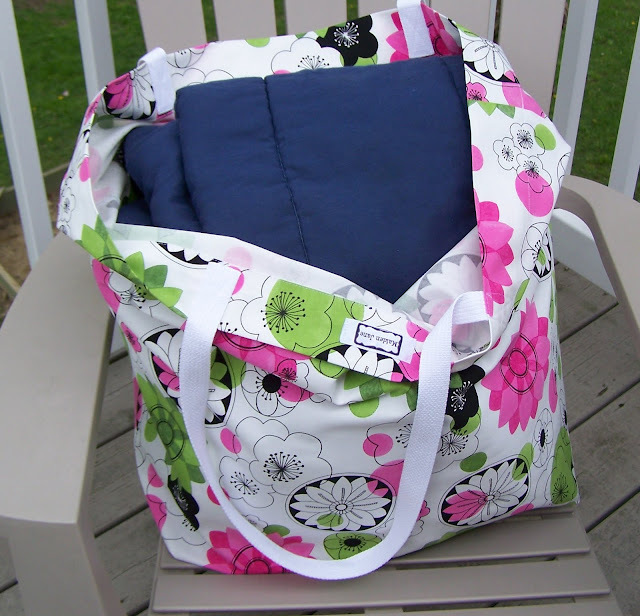 Enjoy your bag for picnics, trips to the beach, stashing sweatshirts in your car, …. Love that fabric, it’s wonderful!! Awesome bag! Thanks for sharing. Love the “unknown” beach bag carrier. Shy kid? I cant wait to try and make this! Thanks! This is a great tutorial! I think I’ll be making one of these before my family opens the beach house this summer. Thanks for sharing a great idea and tutorial. And what a detailed tutorial! oh my gosh! so talented! i really wish i knew how to sew!!! i am making one of these tonight, i will post pictures! LOVE that fabric! Thanks for sharing – I was honored to have you guest post this tutorial on my blog! I made this last night! 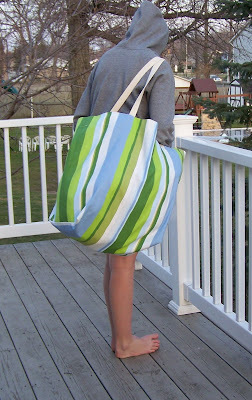 Mine is not nearly as wonderful as yours but I am so excited to finally have a large beach bag this year! I posted a picture (And a link to you!) on my blog. We’ll be featuring your fabulous beach bag tomorrow… come on by and grab a button (and see if you won the giveaway! I haven’t drawn yet, so even I don’t know- haha!). Thank you for a great tutorial! I am going to put this on my list! 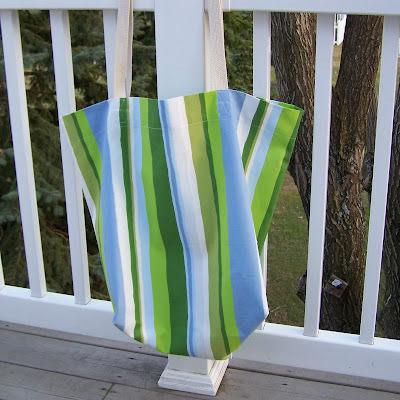 Thank you for the easy and very helpful tutorial… I just finished the one I made and love it. Hi! Love this bag design! Perfect for a big family! 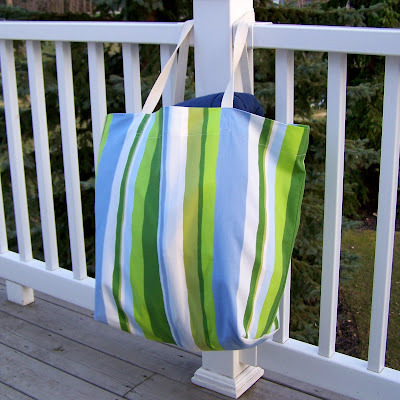 I am linking it to a Summer bag round up over on my blog! Thanks for the great tutorial. I’ve made the bag. Just need some sun so I can go to the beach! I’ve linked to the instructions from my blog glitterarti-ruth.blogspot.com. I added some pockets inside too as I like somewhere to pop my keys! Thanks again for the great inspiration and simple clear instructions. A great sized bag and a comprehensive tutorial!!! Love the fabric in the top bag. I made this tote! It was awesome! Thanks for the tutorial! Thanks for the Tutorial, could you give me the exact size to cut the piece of material. 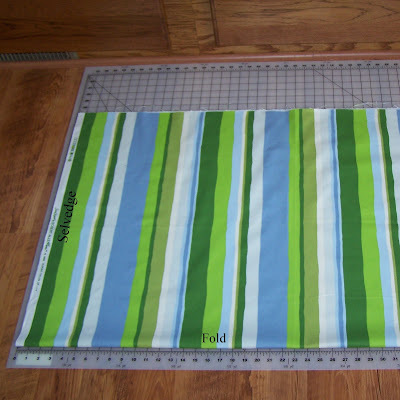 I have some material that is wider than 54″ wide, or should I cut it to 54″ wide?